A Chinese fortune cookie reads, “Relationships is like fingers of you hand. 'One' cannot do much.” That’s one theme that could be read into Black Panther, the Marvel comic which has been turned into one of the largest grossing films of all time. Actually there are lots of themes or paradigms which are implicitly or explicitly part of the disquisition. One is obviously xenophobia. 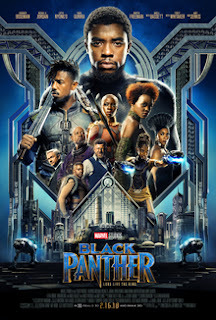 Wakanda, the fictional creation at the center of the action, is a secret gem, an enormously wealthy and advanced nation that hides its resources. In this sense there are echoes of The Matrix with its theme of appearance hiding a powerful underworld or reality. Of course this idea can be spun out into a thousand themes and variations dealing with the conscious and the unconscious and subliminal powers being the ore or lode that's secreted or hoarded. Another major theme is that of the misuse of power. Surely Wakanda’s resources could be utilized to help less powerful nations, but at what point does altruism itself become a form of control. Colonizers both enslave indigenous populations while at same time inadvertently affording advances in medicine and science that improve their lot. Black Panther ends on an optimistic note that separates it from other quasi-utopian blockbusters that leave the universe in enough turmoil to justify a sequel. While there may be a continuing struggle between good and evil, it’s overshadowed by the optimistic view ( in this case of potential cooperation) you might find in a fortune cookie.